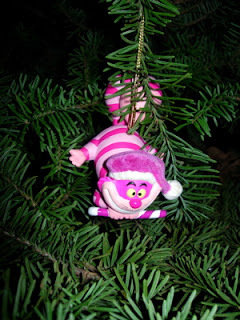 Here are more of my Christmas tree ornaments. 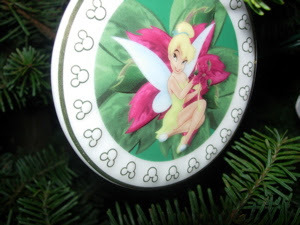 As you can see, I have quite a "Magical" tree! 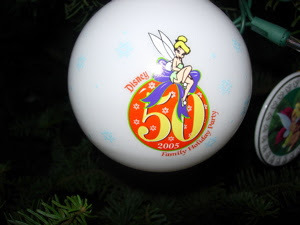 All of these ornaments have been collected over the years from Disneyland, Walt Disney World, and The Disney Store. Aren't they nice? 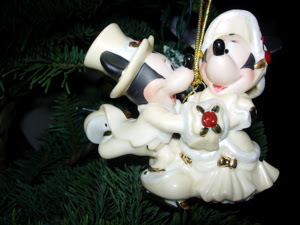 Shown are: A Christmas Tree Ornament, with Mickey Mouse and Minnie Mouse as Christmas Carolers; An Ornament with Tinker Bell (looks like a Christmas Cactus that she's sitting on); A Christmas Tree Bulb featuring Tinker Bell, for Disney's 2005 Holiday Cast Party at Disneyland; Mickey dressed as Santa Claus, with a bone for Pluto; and finally it's the Chesire Cat from Disney's Alice in Wonderland, wearing a Santa hat and holding a candy cane.